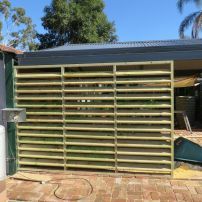 These louvres protect the end of the patio from the sun and rain. 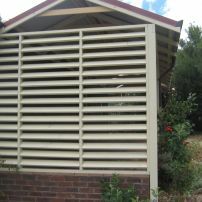 commented on "Louvres and Gate"
Louvres and gate at end of patio. 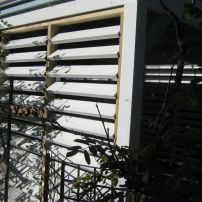 commented on "Louvres from the inside." 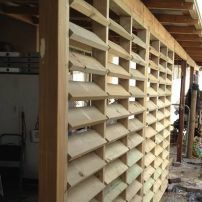 Set of louvres at side of carport, inside view. 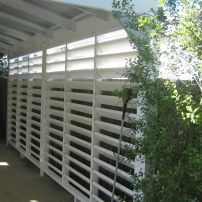 commented on "Louvres on Pergola"
Louvres on the end of pergola to give shelter from the afternoon sun. 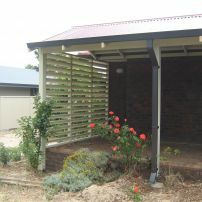 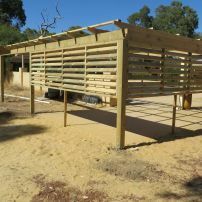 commented on "Louvres on Verandah"
New louvres placed on verandah to keep out the sun and rain. 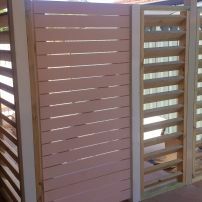 commented on "Louvres Outside View"
commented on "Small set of Louvres"
A set of louvres to give some privacy in the patio.